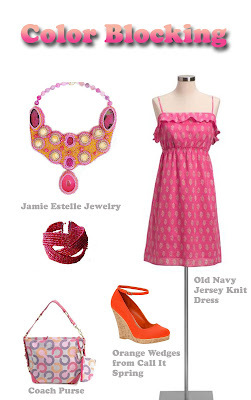 Jamie Estelle Jewelry: The Fashion Clash: Color Blocking! This years fashion must is color blocking. I like to call it the fashion clash! Use up to three colors to achieve the up most color combination. 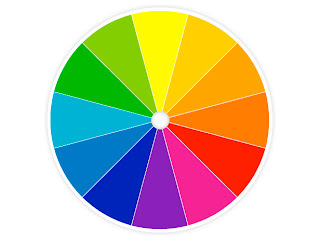 A popular color theory for combining colors is called the rule of two thirds. The rule of two thirds starts by making an equilateral triangle, a triangle with 3 equal sides, on the color wheel. You pick two of the three colors that the triangle touches. These colors will almost always look beautiful together! If your not in to bright colors, stick with your neutrals - black, tan, brown, navy blue, or white. Add animal prints, for more of a dramatic look. It's all about having fun with color, but if color blocking isn't for you. Then use your accessories! 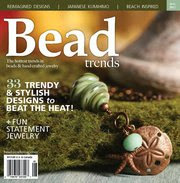 Color blocking with jewelry is a great way to add a little color to your style. For more great jewelry idea's visit Jamie Estelle Jewelry Here Or visit Jamie Estelle Jewelry on Etsy. Def like the pink/yellow/blue, flashy, my kinda color combo. I could see myself in a pink 70's leisure suit, yellow shirt, and blue suede shoes. Hope all are well and thanks for the awesome share!